Spanish settlers called Caparra, the island's first capital, La Ciudad de Puerto Rico (the city of Puerto Rico). Ponce de León, Puerto Rico's first governor, established this first European settlement in 1508. His great ambitions for the settlement collapsed, however, due to the capital's vulnerability to Indian attack. Formal abandonment of Caparra occurred between 1519 and 1521, and the capital was moved to what is now old San Juan. The ruins of Ponce de León's house are located at this site, as well as the small Museum of the Conquest and Colonization of Puerto Rico. 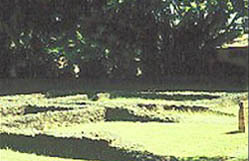 The Caparra Archaeological Site, a National Historic Landmark, is located along Rd. #2 at kilometer 6.2, in Guaynabo, Puerto Rico. It is open 9:00am to 4:00pm, Monday-Friday. Call 787-781-4795 for further information.